Same as above but no garlic or sweet potatoes. We will be adding more winter squash and scallions or chives in place of garlic. Mark your calendar and join us Tuesday, November 19th for a pre-Thanksgiving feast. This is the last farm dinner of the year! RSVP to me at ghahn@caastlc.org or 314.566.8643. We have plenty of room for all, (we just need a head count) and would like all of you to come so we can give our thanks to you, our members in person for a great season. Please remember, this is a FREE cooking class and FREE great meal. At each dinner, I find myself more grateful to those who come and those supporting our program. The food and learning are great, but the greatest function of the dinners is underlying. We get to know our neighbors, make friends, and get to know people who are eating the same food from the same place every week. In our consumer based culture it is so easy to overlook the common grounds we all have, the common grounds we all share. These dinners are a time and place to find both. Following today, we have only two weeks left in the CSA season! Concerned about food for the Thanksgiving feast? Check out next week’s most likely. These are all pretty well in the bag. We will be giving out fewer items but in larger amounts to fill your Thanksgiving table. Keep in mind, butternut squash and sweet potatoes are pretty interchangeable. We’re slim on sweet potatoes, but stacked on butternuts, you’ll be getting those. We can offer farmer grade (good enough to eat but not good enough to sell) sweet potatoes to those picking up on farm in the you-take bin next to the cooler. Please complete and return the attached survey on your next pickup. This survey will help us show our grantors the positive impact we are having in two local food deserts and help us to better serve you. 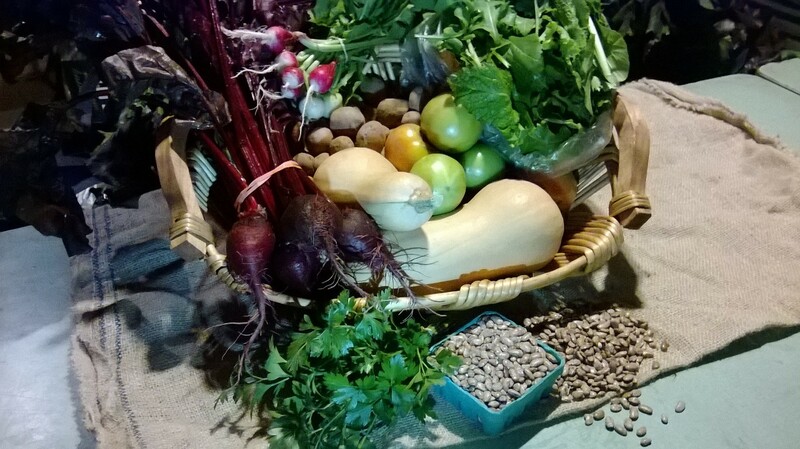 ***New to our CSA: Dried Beans! Low-fat protein and a filling meal option on the cheap! Each share is receiving one whole pound this week. Let us know what you think! See this week’s recipes for cooking and storing info. Green Tomatoes: Fried green or green salsa. Yep. Or, if there is any blush to the tomato you can set in a window, or wrap in newspaper with an apple or a banana, checking for ripeness every few days. Ripening by this method is best done between 60 and 70 degrees. To preserve green tomatoes, keep them dark and below 60. You will see more green tomatoes in the next few shares. Hang on to those green tomatoes! We plan to give out a big bunch of cilantro in the next couple weeks for you to make a nice green salsa that can be put up for the winter. Since Randy introduced me to this site, I’ve made many a pot-o-beans at the start of a week for quick meals until the weekend. One buy, one cook, one clean up, many meals. Thanks Randy, and thanks rootsimple.